The Labyrinth - thrifted and crafted! 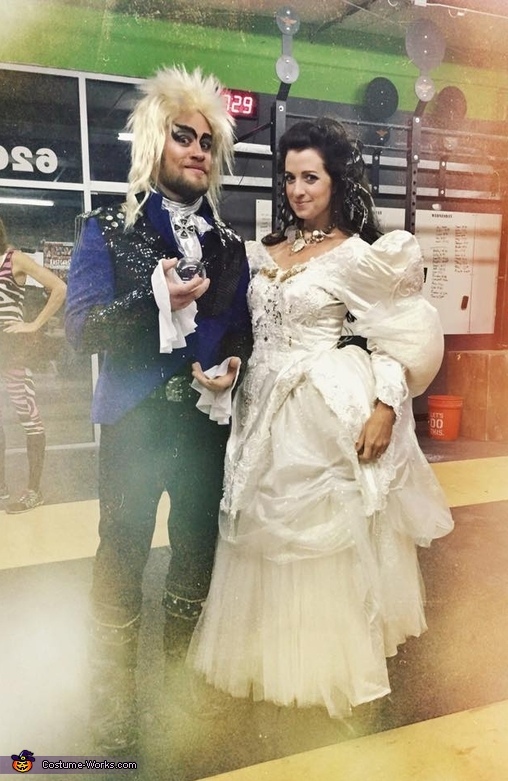 My husband and I dressed as Jareth and Sarah from The Labyrinth. Dress: Goodwill $20 I modified it with some bling, added an additional puffed sleeve on each arm. I stuffed them with some fabric from hobby Lobby and old tulle that came on the veil for the dress. I sewed on a few gold appliques and sequins so it would look more like the dress from the movie. I used another cheap ($2) skirt to make another layer on the dress, and I sewed on some more iridescent fabric to the skirt part of the dress as well. * to puff out the dress I put bubble wrap around a belt and put it on under the dress. I barely fit in the car! The base jacket: is a women’s Dressbarn coat ($4 thrift store) then I added the sequined parts from an old 90’s shirt via a thrift store. I sewed a piece of cardboard into the neckline to get it to stand up. I also sewed up the front parts of the jacket to make it more angled like a tux or band jacket style. I glued sequins and jewels to the shoulders and added some flare to the back of the jacket as well. Ascot: silver fabric $3 and pin $5 I just shaped the fabric like an ascot and pinned it on. Other bling on jacket: I already had them and just glued them on. Faux knee high boots: $8 online. I used a black marker to cover up the skull and crossbones and added jewels to them. Bell sleeves on jacket: I literally just cut them off of a kids dance costume I found at the thrift store. They had elastic in them, so he just put them on under the jacket like a bracelet.